Space shuttle Atlantis will trundle its way to Kennedy Space Center's Launch Pad 39A next Tuesday, in preparation for its much-delayed STS-125 mission to the Hubble Space Telescope. The vehicle, complete with external fuel tank and twin solid rocket boosters, will travel atop a crawler-transporter for the 3.4 mile journey from the Vehicle Assembly Building to the pad. The trip will take around six hours, NASA estimates. 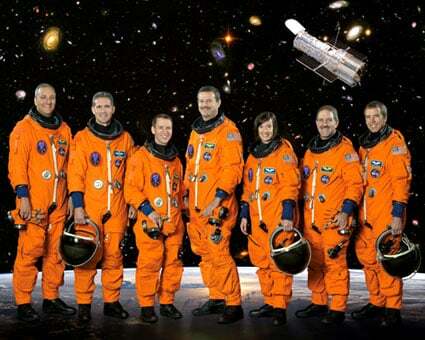 On board for the 11-day "Servicing Mission Four" - scheduled to blast off on 12 May - are (pictured left to right) mission specialists Michael J Massimino and Michael T Good, pilot Gregory C Johnson, commander Scott D Altman and mission specialists K Megan McArthur, John M Grunsfeld and Andrew J Feustel. NASA's mission summary explains that this final servicing trip to the space 'scope will "bring new instruments to Hubble along with gyros, batteries and other components crucial for the telescope’s continued success through the year 2013". Specifically, five spacewalks will see the installation of the new Cosmic Origins Spectrograph and Wide Field Camera 3, plus a refurbished Fine Guidance Sensor which will "replace one degrading unit of three now onboard, and will maintain a robust ability to point the telescope".